Horses are living longer and in many cases are outliving their teeth. Loose, worn and missing teeth can all make chewing difficult and ultimately slow the horse down when eating fibrous material. 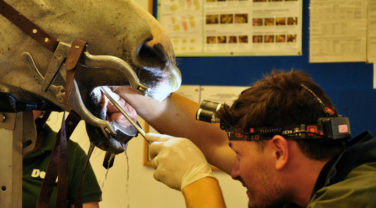 Dental issues are not just confined to older horses though. The apparent increase in the number of horses of all ages with diastemas (abnormal gaps between teeth) means that many horse owners are seeking alternatives to long length forage. As forage should make up at least half of every horse’s diet, it is no surprise that when they simply can’t eat it as easily any more, weight loss and colic can occur. A study funded by Dengie showed that when high fibre materials were provided in a form the horse could manage, they were able to consume just as much as a horse with normal dentition. 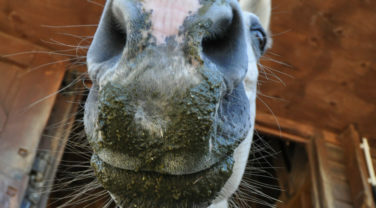 The most obvious sign of dental issues are chewed up balls of forage accumulating at the bottom of the haynet and quidding where the horse spills and drops feed as he chews. Be aware that if your horse has poor teeth they will be consuming less than horses with normal dentition. 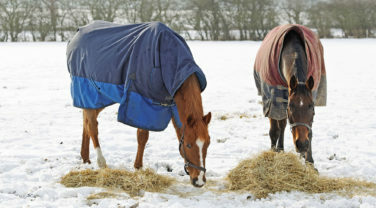 This is important for horses kept in groups and offered forage together – those with poor teeth may miss out on what they need if it’s all been eaten by the others! 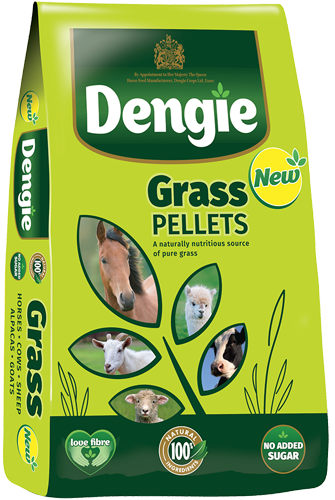 Grass based chopped fibres or pellets can be fed at the same levels as hay although be careful if your horse or pony is prone to laminitis as the concentration of sugar within a pellet which can be consumed more quickly than a grass hay may be too much. Consider diluting with fibres that are lower in sugar such as alfalfa or straw, both of which are available in pelleted and chopped forms. Using a digestive supplement that contains ingredients such as yeast and prebiotics will help to establish a healthy population of microbes in the gut that the horse relies on to digest fibre. Adding highly digestible fibre sources such as sugar beet (Dengie Alfa-Beet) is also beneficial and studies have shown also helps to improve the digestibility of other fibre sources in the diet. Additional high oil feeds such as micronized linseed can be added to provide more energy and should be used in preference to cereal based feeds. A blend of Lincolnshire's finest meadow grasses are dried, chopped and lightly dressed with cold-pressed rapeseed oil from Aberdeenshire. 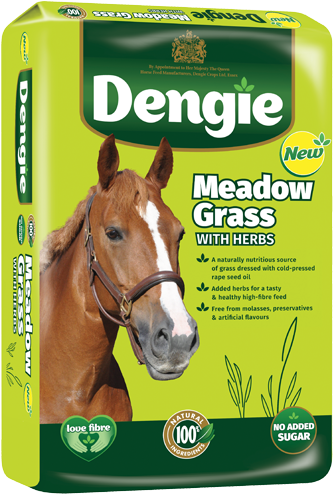 Simply 100% naturally grown meadow grass with no added sugar. An easy to chew, highly digestible fibre feed suitable for all horses and ponies, particularly those with poor teeth. My horse has 3 big buckets of feed a day – is this too much? The answer to this is it depends on what is in the bucket! If you are using a chopped fibre feed such as Alfa-A Oil then it is very voluminous and so a bucketful is probably about 1.5kgs (check this number!). 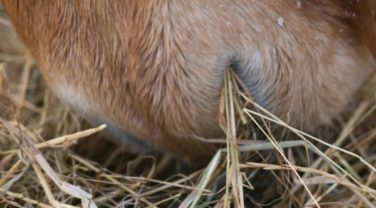 The key thing is also that it is a high fibre feed and so can be thought of in the same way as forage – you wouldn’t be worried about feeding a bucketful of hay. High fibre feeds don’t overload the digestive system in the same way that cereal based feeds can and so it is perfectly acceptable to feed them in bigger quantities in one bucket. In fact, if your horse spends all night eating a big bucket of chopped fibre, it is a much more natural way to feed than giving a small meal of cereals. Horses would spend 16-18 hours a day grazing and the more we can replicate this in the stable the better. With cereal based feeds, giving more than 1.5kgs in each feed is likely to reduce the efficiency with which the nutrients are absorbed and increases the risk of digestive upsets. It is far better to introduce a 4th feed than carry on with 3 large meals. 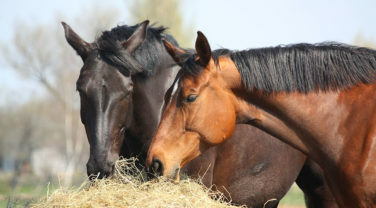 Providing fibre in a form that horses and ponies can manage to chew it ensures that they are still receiving all the vital nutrients to keep them healthy. 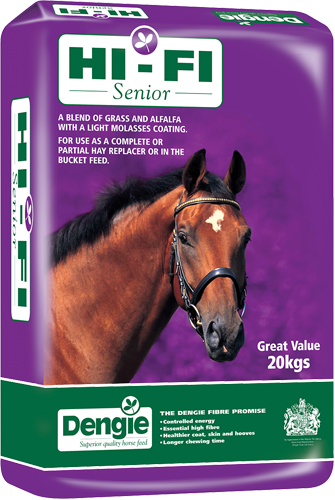 Pelleted fibres that are fed soaked are particularly beneficial for veteran horses, aiding hydration in the performance horse and during winter months. Dental issues aren’t just a problem for the older horse, they can also affect the ridden horse, from the riding club horse through to the performance horse. When horses are stabled hay and haylage are often their main fibre source. The long length of these forages can sometimes cause a veteran horse problems as their teeth become less efficient.